The U.S. soccer team failed to qualify for this year’s World Cup in Russia, and that’s going to set back more than just the development of youth soccer in the United States. The national program will also lose out on a jackpot of winnings just for participating in the tournament. Did you know that FIFA will pay out an amazing $791M in combined incentives for the 2018 World Cup? 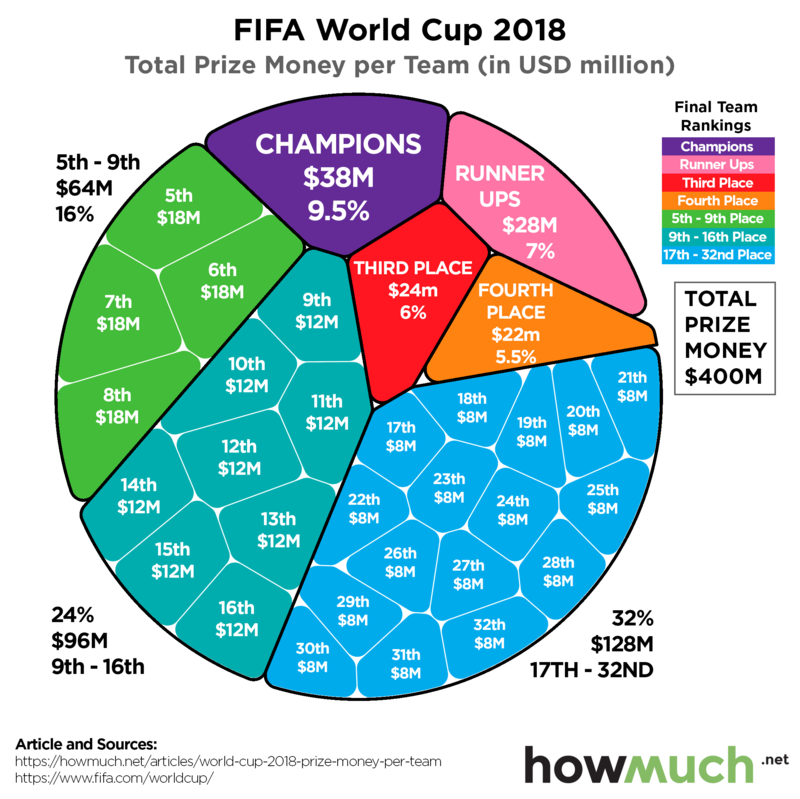 That figure includes $400M for the national teams and an additional $391M for the various soccer clubs contributing their employees (the players) to the tournament. Our new visualization breaks down the prize money each team stands to win depending on how they perform in the tournament. We created a pie chart to look like a soccer ball where each color corresponds to a tranche of prize money. We also included the relatively percentage of the overall purse each team stands to gain for easy reference. Our visualization demonstrates how FIFA establishes an incentive program behind each game, but not exactly how you might think. For the championship match, the winning team stands to make an additional $10M (the difference between first and second place). There is still a payoff for competing for third place, but only an extra $2M. Teams finishing 5th-8th similarly stand to make $4M more than the teams they beat in the elimination round. That all makes perfect sense. But the most interesting part of our visualization is how it reveals the equality in participating in the World Cup regardless of how a team performs. The worst-case scenario is that a country loses every single game in group play and fails to make it into the elimination rounds. That team would still go home with $8M. That’s only 2% of the total purse, but as a group, the teams failing to advance from group play earn the most collective money at $128M. And that’s not even counting the money that FIFA pays to professional clubs that allow players to compete on national teams as well as other disbursements, which brings the total outlay to $791M. All this goes to show that it pays to make it to the World Cup, even if a team gets blown out in every single game. Certainly, a lot of national teams can use the extra cash to help fund player development programs and foster a love of the game. And teams take every chance to make as much money as possible—that’s why Nigeria will be wearing such eye-popping jerseys. That’s just another reason why it was such a disappointment for the Americans to miss the chance at competing in Russia.